We see what Eric Spiegelberg, Senior Consultant and GraphAware, has to say about the fast-moving world of cybersecurity and graph databases. Check out this post to learn more! "Cyber threat intelligence is high volume, unstructured, and highly related. That last attribute makes it great for graphs," said Eric Spiegelberg, Senior Consultant at GraphAware. 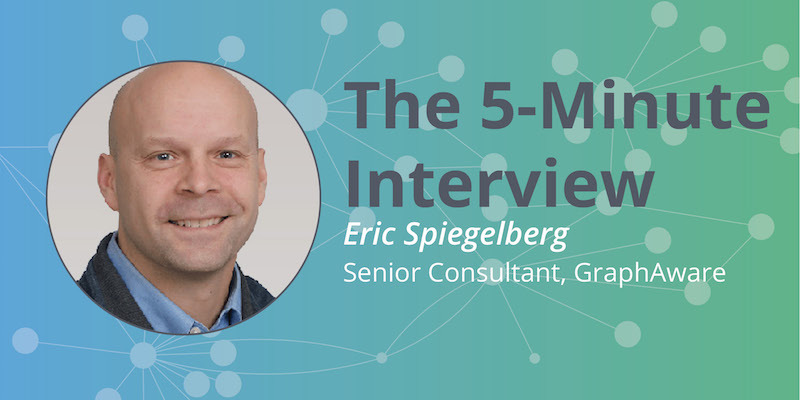 In this week's five-minute interview (conducted at GraphConnect New York), we discuss GraphAware's work on cybersecurity and its natural language processing framework for Neo4j. Eric Spiegelberg believes that graph technology will be omnipresent, and that, with the release of the Panama Papers, it has already changed the world. Talk to us about the kinds of Neo4j projects you're working on at GraphAware. Eric Spiegelberg: I've been spending a lot of my time at GraphAware recently on a project involving cybersecurity research. We had a blog published on the GraphAware website as well as on the Neo4j blog. We've been investigating how we can apply graphs to cybersecurity research and the industry in general because we feel that graphs in general - and specifically Neo4j - are an excellent fit for each other. One of the reasons for that is the shape of the data. We found that cyber threat intelligence is high volume, unstructured and highly related, and it's particularly that last attribute that makes it great for graphs. Anything that's highly related, the more related it is, the better graphs are going to do and the more we find that Neo4j thrives in being applied to cybersecurity. Tell us a bit about GraphAware's natural language processing framework. Spiegelberg: Our natural language processing framework is our big announcement here at GraphAware. We've expended significant time and energy doing a lot of research and development, and our team has just announced the first release of our natural language platform. We're very excited. We'll have as much information as available on our website, and we're really curious to gauge the reaction from the community, generate lots of interest and see how we can all make the best use of it. As a developer, what first attracted you to Neo4j? Spiegelberg: That is a great question. I got my first taste of graphs, and there's no going back. For Neo4j, the slogan is that "graphs are everywhere." And once you get a taste of a graph database, everywhere you look, graphs are, in fact, everywhere. Whether you're talking about something in computers or technology, art or life, graphs truly are everywhere. Once I got a taste of it as a technologist, it was really a life-changing and a career-changing moment. I knew it was something I wanted to go into. And then, as you get interested in graphs, immediately Neo4j bubbles up to the top - at least it did for me - in terms of leadership of the technology, as well as the size and intensity of the community. And it's a very welcoming community. When you look at Stack Overflow, there's a high amount of traffic, with questions and answers. A lot of the people I talk to get very excited very quickly. But because it's so flexible and so powerful, you quickly find yourself asking, "What's the best way to do this?" And I found that the Neo4j community really supports each other; they want to help each other succeed. Can you talk to me about some of the most interesting or surprising results you've seen from the Neo4j projects you've worked on? Spiegelberg: For me, the most insightful or surprising result of graph databases is the Panama Papers. That's something that I'm very interested on a technical level, but the geopolitical ramifications of the whole situation are just astounding. For me, that was an "aha" moment, because it showed that - while Neo4j is just this fantastically, interesting technology - in the real world, not everyone cares about technology. They want results. They don't necessarily care how you get there. But the Panama Papers shows that graph technology is really going to change the world, and in this case, it already actually has. Spiegelberg: If I could go back to my first Neo4j project, I don't think I would do very much differently. Naturally, there's a learning curve that we all experience. On your first project, you learn, and you make a lot mistakes. But what I found is that a great example of the power of graphs is that they're so flexible. As my experience level and comfort with graphs and Neo4j grew, the graph database was flexible and we could make adjustments and accommodate new learnings on the fly. With other technologies or other projects, you would have to be stuck and live with it. And so looking back at the power of Neo4j and the power of graphs, the reason that there's nothing I need to change now is that I was able to change it as I went. What do you think the future of graph technology looks like in cybersecurity? Spiegelberg: Right now, thought leaders are working on specifications and technologies to advance cybersecurity, and they have recognized graph technology as a fundamentally game-changing technology they can apply. In the area of cybersecurity, I think the sky's the limit for graphs, and the adoption level is going to go through the roof. And I think that's it's also true that graphs are everywhere. It's hard to overstate the future of graphs because I think graph technology is going to become omnipresent and infiltrate every aspect of technology. Want to learn more about what you can do with graph databases? Click below to get your free copy of the O'Reilly Graph Databases book and discover how to harness the power of connected data.